Ten years ago, just 7% of the U.S. population(link is external) used at least one social media channel. Now, that number is up to 65% and increasing. The majority of people are on social media, and businesses of all sizes can use the technology to reach current and potential customers in ways not possible before the internet. 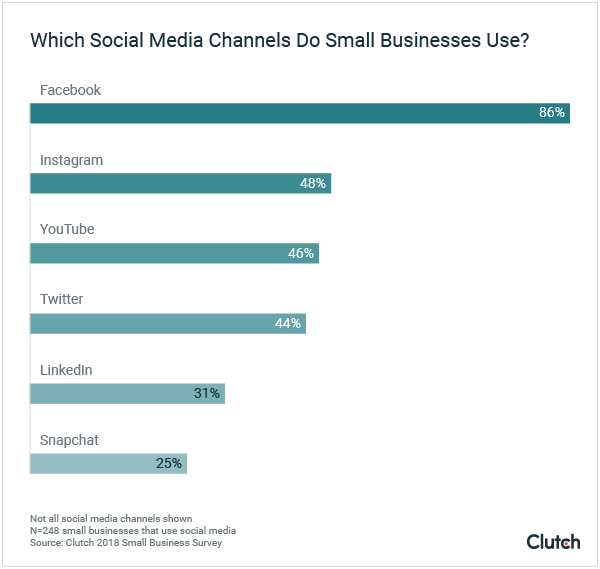 Clutch surveyed 351 small business owners and managers at companies from across the U.S. with fewer than 500 employees to determine their social media habits, the channels they use, and the types of content they post. Small businesses can use this report to learn how other businesses use social media and to improve their own social media strategies. Nearly three-fourths (71%) of small businesses use social media, and 47% began before 2017. Facebook is the most-used social media channel (86%), nearly double the second-most-used channel, Instagram (48%). Women-owned businesses (74%) are more likely than men-owned businesses (66%) to use social media, a reflection of the fact that more women use social media. More millennial business owners (79%) use social media for their business than business owners older than 35 (65%) because millennials have a greater comfort level with social media. More than half (52%) of small businesses post to social media at least once per day, something social media experts recommend. The majority of businesses post images/infographics (54%) to their social media pages because people process images better than text. ​Whether they have one employee or 500, most small businesses use social media. Of the 71% of businesses that use social media, 47% began using it before 2017, and 24% began using it in 2017. 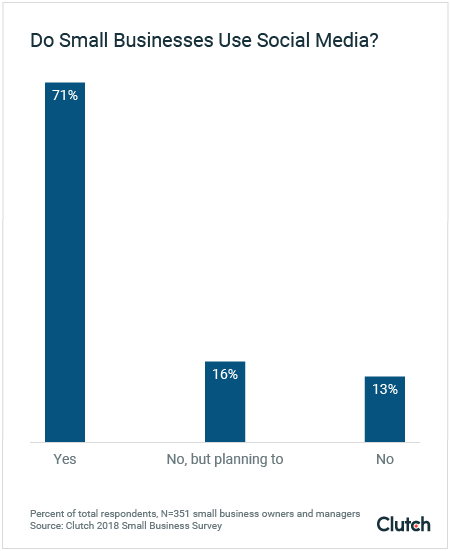 Just 13% of companies have no plans to use social media in the future, a number that should be 0%, according to Jeff Gibbard, chief social strategist at digital agency I’m From the Future(link is external). "I'm surprised 100% of companies aren't on social media. It's 2018. Social media is a necessity." ​Any small business forgoing social media risks falling behind the competition. ​​Despite the increase in popularity of newer social media channels such as Instagram and Snapchat, Facebook is still the most-used channel. Almost all small businesses (86%) use Facebook. 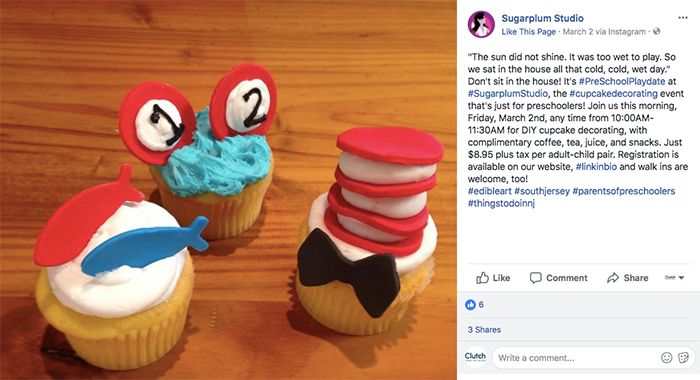 For many small businesses, such as Sugarplum Studio(link is external), which offers cake-decorating workshops and parties in Cherry Hill, N.J., Facebook helps reach potential customers. “Facebook is where we put the majority of our effort,” said Sugarplum Studio Marketing Manager Steve Spatucci. ​Though Sugarplum Studio hosts events for adults, the majority of its workshops and party guests are children. Because of this, it uses Facebook to target women ages 35 to 44, the parents of those potential guests. ​Sugarplum Studio successfully reaches its target audience on Facebook; 97% of its website visitors who come from social media come from Facebook. In fact, Facebook is so popular that more than one-tenth of small businesses (12%) use only that platform for social media. ​Facebook is popular among businesses because it is the biggest platform for consumers – the social media giant has more than 2.13 billion users(link is external) as of Q4 2017 and is growing. Many groups of people use Facebook, so it makes sense that businesses also use it, especially if they want to target a range of potential customers. Data shows that more women than men use social media(link is external) for their personal use, so naturally, more women-owned businesses use social media than men-owned ones. Women-owned businesses (74%) are more likely to post on social media than men-owned businesses (66%) because women are more social in general. Women tend to be more communicative than men, and this translates to the online world, where they are more likely to use social media effectively. ​Fairygodboss(link is external), for example, is a women-owned company that provides job and company reviews for women. Because more women are on social media, Fairygodboss can more easily reach its target audience. 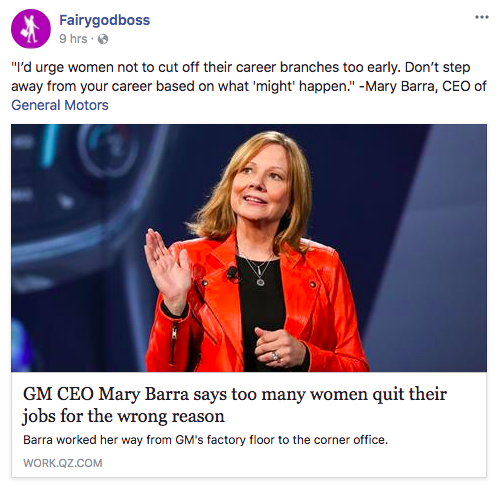 Fairygodboss uses social media to successfully connect with its target audience of women. With women more likely to be on social media, it makes sense that more women-owned businesses are also on social media. ​Millennial business owners ages 18 to 34 are more likely to use social media for their companies than Generation X and baby boomer business owners 35 and older. This is indicative of millennials’ higher personal usage of social media. About 79% of millennial business owners use social media, while 65% of Generation X and baby boomer business owners combined use it. Millennial-owned businesses use social media more because they see its value. Generation X and baby boomer business owners have lived – and possibly run businesses – before the age of social networks, so this group doesn’t always see the need for social media. “Millennials, on the other hand, don’t know anything different and cannot imagine a life before the internet,” Alain said. Millennials don't know anything different and cannot imagine a life before the internet." Millennials’ greater personal use of social media means they are more likely to have social media profiles for their businesses. 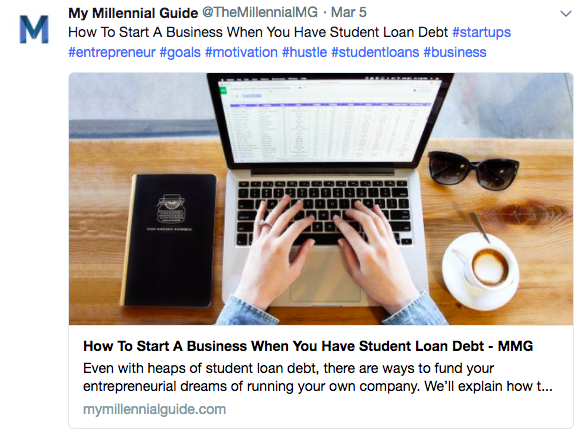 For example, My Millennial Guide(link is external), a personal finance website that gives financial advice to millennials, was founded by millennial Brian Meiggs. Meiggs knows of social media’s importance in reaching My Millennial Guide’s target audience. Because millennial business owners, like Meiggs, understand social media and use it themselves, they can more easily post topics that appeal to their audience, which can eventually lead to a sale. 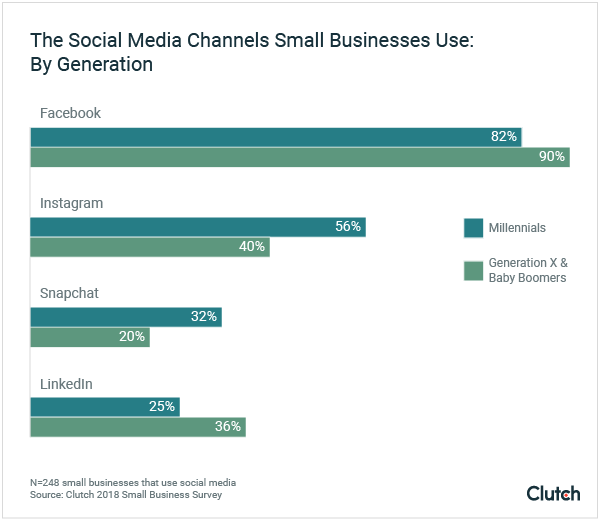 ​The majority of business owners in every age group post to Facebook, but there is a generational difference among other social media channels. ​Millennial business owners prefer Instagram and Snapchat over older generations because they use these channels for personal use more than older generations. Because more millennials are on Snapchat and Instagram than older generations, it makes sense that their businesses are more likely to use those platforms as well. Older generations, on the other hand, are more likely to use LinkedIn than millennials. This is likely due to LinkedIn’s professionalism. Because millennials are more familiar with social media, they are more likely to know how to use the “fun” social media channels for their business, whereas older generations see LinkedIn as a professional network more suitable for their business. The majority of small business post to their social media channels daily – something experts recommend to keep followers engaged. Of the 71% of businesses that use social media, more than half share (52%) content or engage with followers at least once a day. 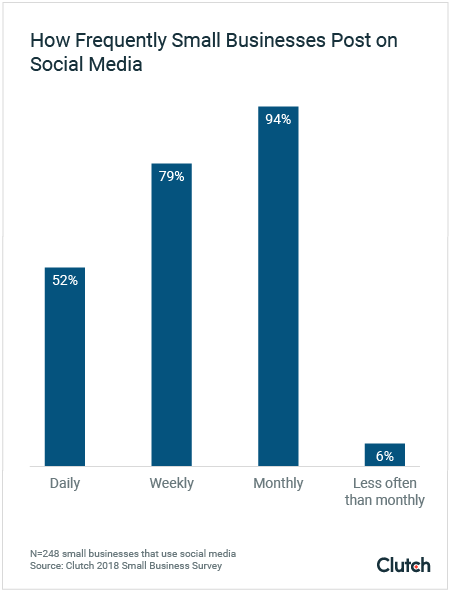 ​Just 6% of companies post less often than once per month. Shawn Alain recommends companies post to social media at least once per day. Small businesses should post on social media regularly but thoughtfully. They shouldn’t waste valuable time and resources by posting too much. For example, NewAir Appliances(link is external), which manufactures products such as wine and beverage coolers, portable air conditioners, and ice makers, posts to social media each day of the work week. “For most brands, I’d recommend at least once a day, but if you do more, consider posting once in the morning and once toward the end of day,” said NewAir Director of Product Marketing Andrew Stephenson. Although posting often is important, companies that post too much can annoy potential customers and lose business. 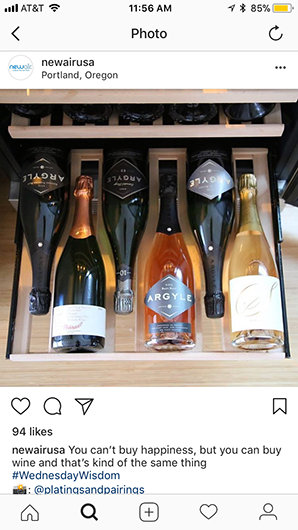 A company has to find the frequency of posting that works for its unique brand. ​NewAir used to post on Instagram once a month. Increasing the frequency to 20 times per month grew its follower count from 200 to 1,500 in less than six months. Posting regularly, but not too often, can help companies grow their followers and, in turn, gain more potential customers. Businesses prefer to share visual content on social media. Although businesses post a variety of content, the majority (54%) post images and infographics. Most businesses post images on social media because they are more attention-grabbing than text-based content, Chipperfield explained. 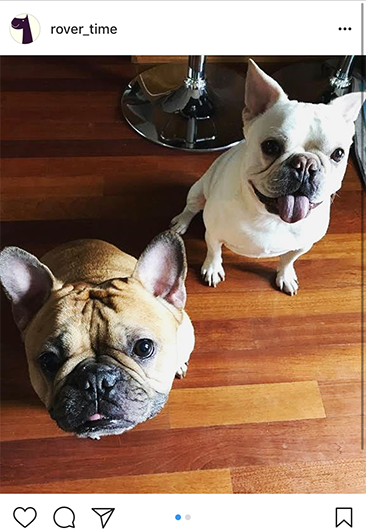 For example, Chicago dog-walking and pet-sitting business Rover-Time(link is external) appeals to customers on its social media accounts through images of animal clients. Clients want to see pictures of their dogs featured on social media, rather than a simple text-only update. ​Although most companies can’t post only dog images like Rover-Time, they can still post visual content that is easier for followers to process than solely text-based content. ​Nearly three-quarters of businesses use social media, but experts say this number should be higher. Businesses that use social media can reach a broader range of people, connect with their audience, and share interesting content. Ten years ago, the vast majority of people and businesses were not on social media. Now, 71% of small businesses use it – a number that, ideally, should be 100%. Whether a company is women-, men-, millennial-, or baby-boomer-owned, all businesses can benefit from social media. ​Clutch surveyed 351 small business owners or managers from across the U.S. with fewer than 500 employees.